Color is often an indicator of the quality and freshness of meat, but canned fish is already cooked. Natural color variations occur, particularly with white tuna. 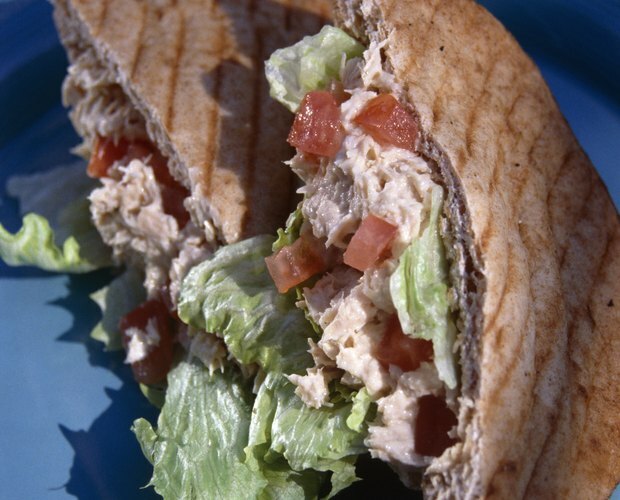 Albacore tuna is the lightest of all tuna and the only tuna in the U.S. that qualifies for the “white meat” label. 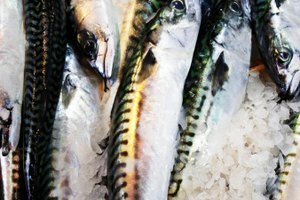 Its meat ranges in color from pink to white to creamy beige, depending on its fat content and the age and size of the fish. Canned tuna comes in two varieties: canned white or canned light. Canned light tuna – also called chunk light -- does not promise to be white meat. 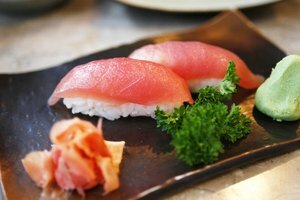 It's made from smaller skipjack, tongol and sometimes yellowfin tuna. 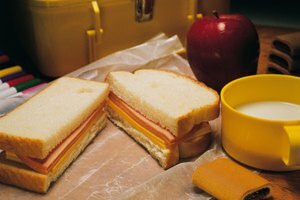 The color of the light meat is darker pink than canned white tuna, and it may contain two-tone colors of yellow and red. Albacore tuna -- also called canned white or chunk white -- has the lightest colored meat of all tuna species. Because canned albacore is processed from multiple fish of different sizes, it is normal to see both pink and white meat in your albacore tuna can; a slight gray cast to the tuna is also normal. 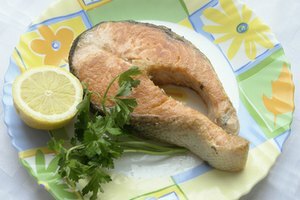 The beneficial fats known as omega-3 fatty acids are the reason so many doctors recommend eating fish: the polyunsaturated oil protects against heart disease, cancer and macular degeneration, which causes blindness. Albacore tuna is an oilier fish than the varieties of tuna used to make canned chunk light, and as such albacore has higher levels of beneficial fat. According to a 2004 study conducted by Oregon State University, the pink-colored meat of the smaller and younger albacore tuna troll-caught off the West Coast have higher levels of omega-3 fatty acids than the larger albacore tuna found in the Pacific. The meat from bigger albacore is both drier and whiter. Mercury naturally occurs in our environment and fish absorb it from the water when they eat smaller water creatures. Larger and older fish accumulate higher levels of mercury, and although tuna isn’t considered a high-level mercury fish, canned albacore has higher levels of mercury than canned light tuna, because most brand-name canned albacore is made from bigger fish. For this reason, the U.S. Food and Drug Administration and Environmental Protection Agency advises pregnant or nursing women to limit their intake of white albacore to no more than three 6-ounce servings per month. Recommended amounts for children under the age of 6 are limited to one 3-ounce serving per month. Albacore tuna can grow up to 5 feet in length and weigh as much as 60 pounds. Most of the canned albacore tuna found in U.S. grocery stores comes from the larger fish caught in the southern Pacific Ocean. This tuna has whiter meat, although it is common to see some pink meat in a can of albacore tuna. Smaller albacore tuna caught off the coast of northern California, Oregon and Washington weigh between 10 and 24 pounds, and their pinker meat contains less than half the mercury levels of larger albacore tuna. While you can’t tell from looking at the canned tuna whether it was processed from big or small fish, contact the company listed on the product label for more information if you have a preference. Environmental Defense Fund: Mercury Alert -- Is Canned Tuna Safe?